Green Fairy Quilts Giveaway ~ Gardenvale, Reel Time or Winterberry? This is such a great giveaway as you can chose from some of the latest fabric collections from Moda! Green Fairy Quilts stocks an amazing range of Moda precuts, all at fabulous prices and with free US shipping (still good deals for us international folks too!). They have a clearance section with even more bargains and you can find notions, thread (including my favourite Aurifil) and more on the website. I love that you can see the new Moda lines before they are released and pre-order pre-cuts to be sure you don't miss out on your favourite designs! Check out all the great designs you can order! For this giveaway Green Fairy Quilts are kindly giving away one layer cake and you can chose between these three ranges! 1. Let me know how you describe your style or taste in fabric! The giveaway is open internationally and ends 4th May 2015. A winner will chosen by random.org. You can not win if I can't contact you so for the love of my sanity please please leave your email address in the comment e.g. fabric (at) emailkilledletters (dot) com - unless you are totally sure you are not a no reply blogger!! Good question!!! Since I quilt to make gifts for others, I always have my recipient in mind for a quilt style, which means that anything goes!!! I do love the Reeel Time collection and would love to play around with it!! I am already subscribed to the Green Fairy newsletter!!! I'm a punk Cath Kidston! Roses, polka dots and skulls. With some Japanese Kawaii and vintage. Hell, I love it all! That Gardenvale is a beaut, though!! I am following you via Bloglovin!! Thanks! And I signed up for the newsletter, thank you for the giveaway both!! I love geometric patterns so reel time is my favorite. Thanks! I favor the "Reel Time" fabrics. I like working with solids and geometrics. I love vintage style and solid colors... so i love reel time and winterberry! I love Gardenvale, all the colors and flowers. 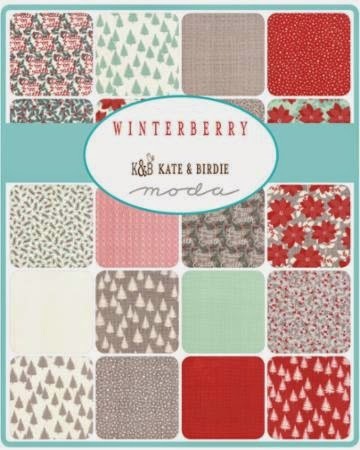 I love Winterberry and I'd make a cozy lap quilt for the winter. I receive the newsletter from Green Fairy. Modern pops of color that vere away from loud florals. I love vibrant saturated colours paired with dark plaids or black and white stripes. I love the vintage modern look. I am torn between Gardenvale and Reel Time. I am also a subscriber to GFQ's newsletter. I love fabric with a vintage/retro look 40s, 50s or 60s - yes Gardenvale ticks all the boxes, as does Reel Time - love those TVs. I receive Green Fairy News and am now a follower of your blog, although I do follow you on Instagram and love your posts! Oh and following you via Bloglovin! I like modern bright colored geometric fabrics. My taste in fabric runs from civil war repos to bold modern prints to beautiful solids. I love fabric of all kinds. The great thing about it is that I have a stash that covers just anything I want to make. As for which layer cake I like the best that would be Winterberry. Not sure of my style-some modern, some traditional with a bit of a flair. I like the Winterberry layer cake a lot! Green Fairy is a great shop-just ordered from them over the weekend. I follow you on Blogovin! I would like to make my sister a lap quilt with Winterberry. I already get Green Fairy's newsletter! I like Reel Time for the colours and the patterns, nothing too fussy. Thank you for the giveaway. I am not sure how much I could describe my taste.. perhaps a little old fashioned, but not retro? Bright and clear for preference! and, yes, Lucy, I do follow you! Thanks for the giveaway, Lucy. I am more of a traditional person. I love small prints and solid colors. My favorite fabrics are vintage or reproduction fabrics. I really love the Winterberry. I would describe my style as 'all things Bonnie and Camille'. I love brights and pretty colours - so 'happy and beautiful' is my style. Lately I think my style in fabric is changing. I still like modern and geometric but I seem to like softer colors and florals more as well. I think my style is random and depends on the day. My favorite of these three is Reel Time. Though they all look fun for different reasons. I get Green Fairy Quilt's newsletter. My problem is I like pretty much all fabric... It's easy to say what I don't like! I like colourful prints with a modern bent and I'm quite partial to a geometric design. Bright, fun, eclectic, and modern are some terms I would use to describe my taste in fabric. Reel Time is at the top of my wishlist! I get the Green Fairy newsletter. Love their shop and Judi's amazing quilting! I follow and enjoy your blog via GFC. Thanks for the chance to win! WOW! Over eighty comments already! This is a popular one.... I describe my fabric style as 'eclectic'!! Thanks for the chance to win- I have my eye on that Gardenvale pack! My style in fabric is all over the place...but tending toward distinct patterns. 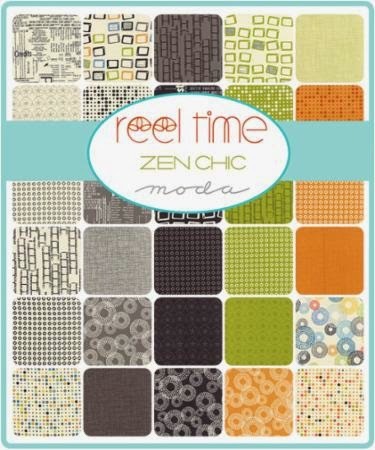 It's difficult for me to describe my style, but I do like the Reel Time Zen Chic bundle the best of the three. Maybe because it has angular shapes and cool colors. I'd be able to put the bundle to good use! I follow your blog , Charm About You, on Bloglovin'! I also receive the Green Fairy newsletter and have ordered from them several times! I would choose any of the layer cakes. I love the scrappy feel of Gardenvale, the fun and modern feel of reel time. And pretty much anything by Kate and Birdie. I love the new "modern" look, with gray as a neutral against bright colors. I'd have to pick the Reel Time layer cake! I like to think my fabric taste as eclectic. I like whatever fits the project! If I won I would pick Winterberry. I don't have many Christmas fabrics in my stash and these would be very welcome! I follow you through Blog Lovin! I already get the Green Fairy newsletter. They are a wonderful company to order from! All over the place, I'm better at what I don't like. Almost anything can catch my fancy... Right now LOVE LOVE LOVE Reel Time, no wonder my all time favorite line is Comma..
My style is interesting. I like bright happy floral fabric with a vintage vibe. When it comes to buying fabric I'm like a kid in a candy store. I have a difficult time making up my mind. I do find myself drawn more to the modern/metro patterns so I have my eye on Reel Time. My favourite fabrics are bright colours - I love batiks - I love Kaffe Fassett - Liberty Prints - and all Free fabric! I follow Charm About You on email and blog. Thanks for the giveaway chance. Still exploring the fabric world and I think you could describe me as having eclectic tastes. Usually something bold though. I follow on Bloglovin and FB. I love all fabric, any fabric. I do have an extra love for Batiks and 30's but really anything is good with me. I'm a big fan of Green Fairy already. I would pick the winterberry. I pretty much like all fabrics. I especially love florals, and polka dots. I love blenders, simple designs and not massive expanses of white. My favourite fabrics are probably vintage style florals and geometrics, in all colours. Tone on tones are my total favourites and I also struggle to resist a print with unusual animals on it- give me snails and frogs and crabs and grizzly bears any day. My style is all over the place! This year I have been trying to 'print-up' my stash (I love solids)! 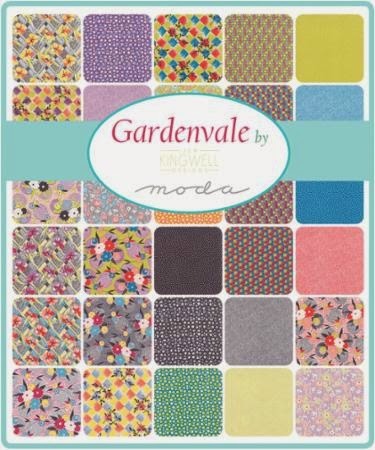 I'd go for Gardenvale as its style covers a bit of everything. I'm not sure I have a style, be it fabric or otherwise! I tend to be attracted to small prints and clear colours, whether they're bright or pastel (i.e. no murk!) and I don't like brown of any description! Most of my stash is probably tone on tone, polka dots, and stripes! I'd choose Gardenvale as everything I've seen made with it looks wonderful! P.S. Just had a closer look at Reel Time and now I'm dithering about my choice! I follow you through Feedly. I'm drawn to geometric prints and I love the Reel Time line! I like bright colours and modern design, Reel Time is definitely up my street! I am more a modern bright fabric person. I have loved all of Zen Chic's previous ranges so I would pick the reel time later cake! My taste? Probably you could say I am more of a country style person, but actually i love just all those blooming fabrics! I am already on Green Fairy's list, yay! I'd say my style is eclectic! Depending on my mood and what I sewing! I'd love the Winterberry layer cake to go with my jelly roll and charm pack that I will be making a Christmas quilt with soon! I like fabric with large flowers on it, some batiks, owls, cats, foxes, kitchen themed fabric, fruits and vegetables on fabric, ombre, glittery, and cute bird fabric. I'm not sure what my style is. I like the traditional patterns but want to branch out into more modern stuff. That Zen Chic package would certainly help. I already subscribe to Green Fairy Quilts. I love the modern look, so it would have to be Reel Time for me :) thanks for the sweet giveaway! I love the gardenvale - simply beautiful. I have weird tastes. I like modern fabrics that reads as solids, I like novelty fabrics, I like the old timey prints like Aunt Grace fabrics, I like bright and cheery fabrics... I like... well, you get the idea!!! I can't decide between Reel Time and Winterberry. I'm loving the colors of Reel Time and the Prints of Wnterberry. In the end, I think I would go with Winterberry due to the prints and the contrast between colors. Than you for a chance to win! I think my taste in fabrics must change daily! I love the Reel Time "Zen Chic" designs today. Thanks for the chance to win. I follow you via e-mail. Thanks again! I'm on the mailing list (newsletter). I didn't know you had a newsletter but I just signed up! Woo Hoo! HELLO, I love "Winterberry" and would choose it! Thinking of Christmas projects already LOL ! I am on the newsletter too. I love both the gardenvale and the winter berry - simply beautiful! i follow green fairy on blog lovin'. my taste in fabrics is very eclectic; i love all three lines but maybe real time a little bit more than the others. thanks for the giveaway. I lean toward fabrics that are modern and graphic so I think I'd like the Reel Time layer cake if I won. Thanks for the giveaway! I love earth colors, I love brights, my favorite colors are purple and green!